Gr 7 Up Kaufman and Spooner focus on new characters and a new world in this splendid return to the universe that they created in These Broken Stars (Hyperion, 2013). Captain Jubilee Chase is the longest serving soldier on the partially terraformed planet of Avon, the only person who has proved immune to "The Fury," the mindless rage that strikes off-worlders who come to serve on Avon. Flynn Cormac is a member of the native Fianna rebels, who hopes that by kidnapping Chase, he can discover more about a mysterious facility hidden in the swamp to the east of the military's main outpost. Neither wants a return to the open warfare between the military and the Fianna that ended a decade earlier with the execution of the Fianna's former leader, Flynn's sister. The two develop a mutual respect that grows to something more--even as their alliance comes to be seen as a betrayal by both sides. Midway through the book, Tarver Merendsen and Lilac LaRoux make appearances, tying the many unexplained events in this title to those in the first volume of the "Starbound" trilogy. Kaufman and Spooner prove that their first brilliant installment was no fluke with this strong second outing. They provide complex characters and a situation with no simple solution. 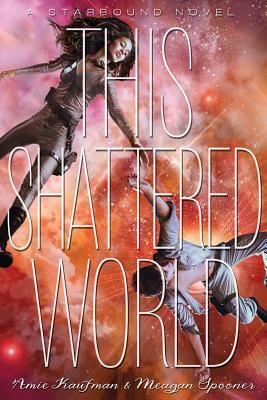 There is action, a spark of romance, and a mystery, all set on a fully-realized planet. This should have broad appeal among teen and adult science fiction readers. Avon is a young world, but colonization efforts over the last decades have stopped, and the planet is perpetually shrouded in clouds. Locals believe that the corporation controlling the planet's development is stalling, preventing Avon from gaining full political rights. Jubilee Chase is known by soldiers on Avon as Captain Lee Chase, a no-nonsense officer who respects her troops but demands the best. To the rebels, she is a cold-hearted, soulless killer. But when she is kidnapped at gunpoint by Flynn Cormac, her life-as well as his-is forever altered. Flynn wants to investigate a secret facility east of town connected to Avon's lack of development, but they cannot find it when they get there. In the midst of a nascent civil war, bringing her to the rebels' hideout proves to be a bad idea, and the situation quickly devolves into open conflict. Now both Flynn and Jubilee must discover what is causing the Fury before the bloodbath engulfs the planet.